BSF Notification is out. 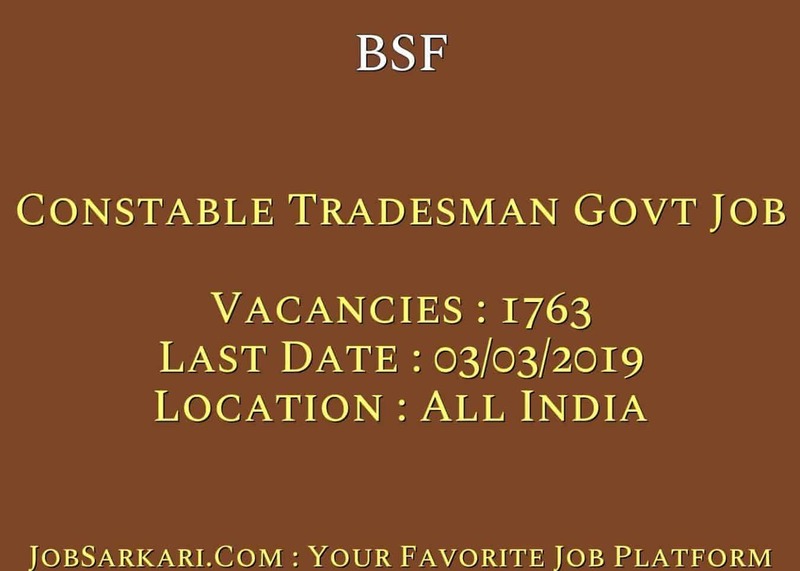 BSF is recruiting for 1763 Constable Tradesman Govt Job Posts. You can check BSF - Border Security Force last date, download BSF notification, visit BSF official website and check other BSF Vacancy details.Complete Vacancy and recruitment Details about 1763 Constable Tradesman Govt Job vacancies in BSF are provided below by JobSarkari.Com only for you. Last Date for Receipt of Application Form. 03/03/2019. Cobbler 21 05 03 03 32. Tailor 25 05 03 03 36. Carpenter 12 02 00 00 14. Water Carrier 168 59 39 23 289. Washer Man 132 59 39 23 253. Barber 76 34 23 13 146. Sweeper 203 88 65 33 389. Waiter 06 01 01 01 09. Painter 00 00 01 00 01. Darughtsman 00 01 00 00 01. Tailor 02 00 00 00 02. Total No. of Post 936. 385. 263. 149. 1763. Having 01 Year Certificate Course From Industrial Training Institute of Vocational Institute along with Minimum 01 Year Experience in Relevant Trade. Candidate Must Have Passed 02 Years Diploma From Industrial Training Institute in Relevant Trade. Age Relaxation 03 Years For OBC And 05 Years For SC / ST Candidates. 5. Concerned RAs/Headquarters, According to the State (Please Read Page no. 02 to 04 for Details of Address) On or Before 03rd March 2019, (18 March 2019 for Far Flung Areas). Q. What is the Last Date For BSF Constable Tradesman Govt Job Vacancy ? A. 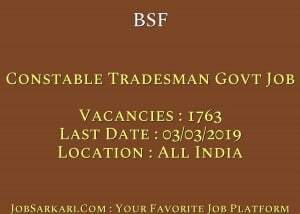 Last Date for BSF Constable Tradesman Govt Job Posts is 03/03/2019. Q. What is the Form Type of BSF Constable Tradesman Govt Job Recruitment ? A. The Form Type for BSF Constable Tradesman Govt Job Posts is Offline. Q. How many vacancies are available in Border Security Force Constable Tradesman Govt Job Posts ? A. There are about 1763 Vacancies in Border Security Force Constable Tradesman Govt Job Posts. Wht is the maximum age of gernal category man in bsf ??? Which name should be mentioned on DD ?? Is Last Date Nikal Chuki Hai Ab is Post ke Liye Aap Apply nhi kr Sakte..
Han Offline Jama Karna Hai..